The Rocky Mountain College Theater Arts Department provides an opportunity for students to be exposed to and delve into the full and rich world of theater. It is an educational theater – meaning that everything that is taught, made, or performed is geared toward education and learning. This year the RMC theater arts department has teamed up with the RMC education department to provide a unique experience for some of Billings’ youth. Every semester, the Education Department reaches out into the surrounding schools and places its education students in active classrooms for their practicum classes. The idea behind these placements is to expose future teachers to a classroom that might be very similar to their own one day and experience, hands-on, how to teach and manage a classroom. These education students become involved in the lives of the students, create relationships, and influence them through their practice teaching. If you want to teach someone how to become a teacher, set them up in front of a class and let them teach. If students from RMC are going to go out and be involved in schools, why not have it the other way around as well? During a recent English lesson at Billings Elysian School, I delivered an opening anticipatory set in which I performed a few lines from one of Shakespeare’s plays. The kids loved it and asked if they could come see his upcoming performance of Rocky’s showing of Shakespeare’s “Cymbeline.” At the time I thought it might be a fun idea, so I asked Rocky theater director, Jayme Green, and his colleague, Aimee Konzen. Green, a Rocky theater professor and director of “Cymbeline,” loved the idea of doing a show for the Elysian School. His initial reaction was, “Let’s do this. This is exactly the sort of thing that I have wanted to do for a while.” Green has been working to make changes in the theater department, including making shows free admission with a suggested donation amount. He wants the theater to be open to everyone and expose people of all ages to the stage. Not only were the students from my English class there, but the entire Elysian Middle School was also in attendance on Friday, Nov. 4. This was an incredible opportunity for the students to be exposed to theater from such an influence as Shakespeare. They also had the oppurtunity to be educated outside the classroom and to be exposed to the personal growth through education that Rocky Mountain College is known for and continues to pursue. 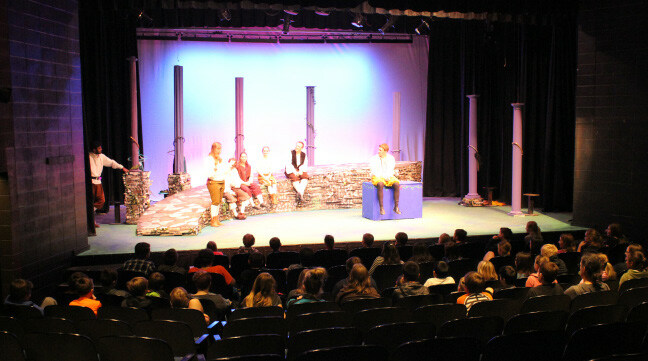 The theater department was grateful for the opportunity to perform in front of a younger audience that may have little or no exposure to Shakespeare, let alone live theater. The goal was not to recruit future actors, nor was it to promote the theater department to the public, but to expose these students to the tradition of comedy and drama that has been part of our world culture for hundreds of years, and to show them how education can be achieved through the theater. How can a teacher present a topic, a book, an idea to get the students excited about learning? How can a teacher keep students’ enthusiasm up? Are elements of theater not used in teaching? As Shakespeare aptly noted: “All the world’s a stage, and all the men and women merely players.” Teachers aren’t necessarily actors, but there are performing elements present when a teacher steps in front of their class. This opportunity for the students was not just a field trip to the theater; it was part of an introduction to Shakespeare in my class. During the lesson before the show, I introduced Shakespeare: the literature, the history, and his influence on the English language and story writing. The concepts of theme, archetype, plot, conflict, poetic element, and much more can be gained from Shakespeare’s writings. These are important and should be addressed in any English class, but there is also another level to Shakespeare that is lost in just reading and analyzation: the performance. Aimee Konzen, an English teacher at the Elysian school and field trip coordinator worked with me to provide an opportunity for the students to see this performance. We go to college to acquire knowledge, to further our understanding of the world and how we fit into that world, to build strong relationships, to be challenged, to find our own voice, to influence and be influenced, to find out who we truly are, and to become the best individuals that we can. We learn how to learn, we think about how we think, and we realize that what we do here will impact the world out there. I want to be a teacher to help kids to become the best that they can be. I also have a passion for the theater. Rocky Mountain College has given me the opportunity to pursue this passion, through this event, and my education as a whole. Let’s continue to provide that same opportunity to the young people of our community. The RMC theater department will continue to show Shakespeare’s Cymbeline though Nov. 12.